We’d love your help. Let us know what’s wrong with this preview of John Brown by John Hendrix. Published on the 150th anniversary of John Brown’s raid on Harpers Ferry, this biography explores the life of one of American history’s most controversial figures. A great deal of academic study has been published recently about John Brown. This is the first book for young readers to include these new attitudes and research. In the late 1850s, at a time when many men and w Published on the 150th anniversary of John Brown’s raid on Harpers Ferry, this biography explores the life of one of American history’s most controversial figures. A great deal of academic study has been published recently about John Brown. This is the first book for young readers to include these new attitudes and research. In the late 1850s, at a time when many men and women spoke out against slavery, few had the same impact as John Brown, the infamous white abolitionist who backed his beliefs with unstoppable action. His dedication to freeing the American slaves made him one of the most recognizable leaders in the liberation movement to end slavery. 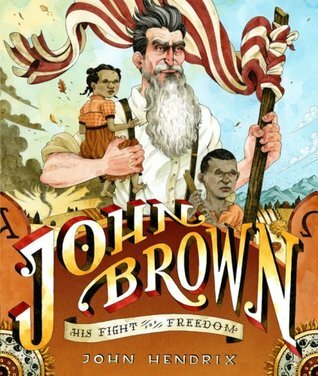 Told through engaging, thoughtful narration and bold, dynamic illustrations, John Brown: His Fight for Freedom is a fitting reminder that all men and women are created equal, and that some things are worth fighting for. The book includes an author’s note, a bibliography, and an index. To ask other readers questions about John Brown, please sign up. I'm immensely impressed that John Hendrix attempted this picture-book biography of a man who, even one hundred and fifty years later, still evokes strong responses in most Americans. I think he did an excellent job presenting John Brown's virtues, as well as his weaknesses, and I felt that I learned quite a bit. I'd had no idea, for instance, that Harriet Tubman had agreed to fight with Brown, but had been prevented by illness. Nor was I aware that Brown had the chance, during that fateful raid on Harper's Ferry, to take a multitude of innocent hostages, when a train passed through town, but elected not to. I did feel that there was a disconnect, from time to time, between the narrator's assurances that Brown didn't embrace violence, and the actual choices and actions being depicted, but it's possible that that contradiction accurately reflects the man himself. Wow! It’s hard to know how to rate or review this book. It’s a very “heavy” book for kids, and definitely for older children, I’d say 9-13. In the author’s note, and implied in the book proper, the author makes a point of expressing how John Brown’s actions were for the greater good, for his principles. The author didn’t quite convince me, though his arguments are admittedly compelling. The story tells about John Brown’s fight for equal rights for black people and his fight to end slavery in the Wow! It’s hard to know how to rate or review this book. It’s a very “heavy” book for kids, and definitely for older children, I’d say 9-13. The story tells about John Brown’s fight for equal rights for black people and his fight to end slavery in the United States. The account is very interesting, although at times the book read as something a reader would read for a book report. It’s not that it’s boring; it’s not, but it does read as a straight history book. I liked how Harriet Tubman and Frederick Douglass make appearances, and I did learn quite a bit about the specific events, though at the end the author does say some specifics were fictional, so I do wonder which were factual and which were artistic license. Some of the events and images are shocking, not the least of which is the noose around Brown’s neck, and some dead people. The illustrations for the most part are wonderful. Both some pictures and some quotes/text have a three dimensional appearance, which is particularly effective in the more intricate, busy pictures. The best thing about this book, I think, is that it is effective fodder for discussion of the issues addressed, the most crucial of which is to what lengths does one go for what one believes in. Though I admire his dedication, I don’t personally agree with John Brown’s actions. The author does do a good job though of explaining the times and circumstances and why Brown’s behaviors might have been as they were. Very thought provoking! Perhaps this book was meant to be inspiring, and it was educational, but I found it rather depressing and quite disturbing. I am awed by Hendrix's sheer audacity in taking on such a complex topic for a picture book biography and even more impressed with what a stunning success it is! This is an interesting, if biased, picture book biography of a controversial historical figure. What really stands out about it are the illustrations, which give readers a good sense of both the time period and of Brown himself. The more I read about John Brown, the more I admire him. History has not been kind to him which is a shame. If there had been more men like him during the creation of the US, perhaps the history of slavery would have been quite different. The author, Mr. Hendrix, has done justice to the source material and his illustrations are just marvelous. A perfect book to introduce a kid to such a pivotal figure. I have mixed feelings about this book. I found the story to be quite boring, but I absolutely loved the illustrations. John Brown is the true story of an abolitionist who was tried as a traitor by the United States. The story recounts his fight against slavery, his death by hanging (the picture was a bit disturbing), and his legacy. Hendrix, John John Brown: His Fight for Freedom (2009) . Published on the 150th anniversary of his daring raid on Harper’s Ferry, this colorful biography highlights the battle one man fought to end slavery. Not only do the details of his life capture the reader’s attention, but some of the minutia included on the raid, such as the fact that the Marine lieutenant leading the charge into Harpers Ferry with Colonel Robert E. Lee hastily grabbed a ceremonial sword before heading to Harper’s Ferry! This act was one small detail that ultimately prevented John Brown’s death at the hand of the assaulting military forces because when the lieutenant thrust his sword into Brown’s belly, it bent and folded like a flimsy piece of foil. This book would make a great tie-in for US History when covering the events leading to the American Civil War or on the topic of the abolitionist movement for primary grades. The amazing stylized illustrations reminiscent of a colorized version of the political cartoons of that era are lovingly colored and detailed. They accentuate the story with their portrayal of the man, the cause, and the proceedings of the day. This book, detailing the life of the famous abolitionist, would make a great addition to any primary school library. Short Review: This is a complex portrayal of a difficult character in history. It doesn't hold back. It includes the Kansas massacre where five slave supporters were killed in cold blood. The fact that the first death by Brown's forces at Harper's Ferry was of a free black man. It also includes positives about Brown like his Christian motivation and his understanding that violence on behalf of freeing the slaves was in his mind justified because of the greater injustice of slavery. Brown is no l Short Review: This is a complex portrayal of a difficult character in history. It doesn't hold back. It includes the Kansas massacre where five slave supporters were killed in cold blood. The fact that the first death by Brown's forces at Harper's Ferry was of a free black man. Brown is no less a complicated figure after I read this. I have only read about Brown in context of biographies of Fredrick Dougass and Harriet Tubman, and not a longer look at him. So I am sure I am missing some context. But I was impressed that a children's book attempted to deal with Brown and kept him a complex character and did not gloss over the negatives. A figure from American history that most have heard of but we've probably forgotten the specifics, even those of us that just live a short drive away from Harper's Ferry. Hendrix does a great job distilling the core of this story down for young readers. The author's note in the back let's you know how much research and thought he put into recreating this story of a very complicated man. I found this book very informational about John Brown. I had maybe learned about him when I was younger, but wouldn’t know how significant he was to this day. I found it very interesting that he had worked alongside with Harriet Tubman and Frederick Douglas. Overall, I found this book very informational about what John Brown had done to help the fight against slavery. This is any interesting take. I don't really know much about John Brown, though I recognize his name from learning about the raid on Harper's Ferry. I feel after reading this book, I really need to know more on the subject before I would read this book to children. John Brown was a great man and this biography does him justice. This book is appropriate for grades 4-5. I think this is a great story to read in a classroom. It shows students that if you are passionate and want to make a difference, you can succeed if you try your best. I’m so happy that John’s story is being told. What an amazing man. It is encouraging that there were people standing up against slavery. Okay text, ugly illustrations. Useful information. Gorgeously illustrated tale of John Brown and his own version of guerrilla abolitionism. Inspiring and tragic. John Brown led an attack on Harper’s Ferry in an attempt to obtain weaponry for his army, an army he hoped to use to defeat slavery. The attack did not go off as planned and Brown was hung for his efforts. I’ve always seen Brown as a terrorist, but he is not presented this way in the book; he comes across as a man who deplored slavery, loved God, and desperately wanted to stop slavery in America. The pictures are fun and bright and add a lot to the book. The text is a bit long winded for younger John Brown led an attack on Harper’s Ferry in an attempt to obtain weaponry for his army, an army he hoped to use to defeat slavery. The attack did not go off as planned and Brown was hung for his efforts. The pictures are fun and bright and add a lot to the book. The text is a bit long winded for younger readers, but it would be perfect for an older group of readers, such as junior high or high school students. An author’s note explains why Hendrix came to write the book and shows where Hendrix obtained his information. The book also includes a list of sources. The children, eight first grade students, who previewed this book didn’t really know what to make of it. The story was unfamiliar to them and they really didn’t even know enough about the Civil War or slavery yet to be able to really understand what was going on. The ratings with this group were a mix of 3’s and 1’s, but I imagine that upper elementary students would enjoy it a lot more. John Brown may have been a heroic champion for freedom, or he may have been a homicidal lunatic. Hendrix takes the former stance, portraying Brown as a virtuous leader who had to make tough decisions. He introduces Brown as a polite, genteel fellow who goes out of his way to show respect to his black neighbors. In fact, Brown--a white man--is even more passionate about racial equality than many former slaves at the time, including the legendary Frederick Douglass. Inspired by scripture, Brown de John Brown may have been a heroic champion for freedom, or he may have been a homicidal lunatic. Hendrix takes the former stance, portraying Brown as a virtuous leader who had to make tough decisions. He introduces Brown as a polite, genteel fellow who goes out of his way to show respect to his black neighbors. In fact, Brown--a white man--is even more passionate about racial equality than many former slaves at the time, including the legendary Frederick Douglass. Inspired by scripture, Brown designs a plan to take the south by storm, freeing slaves along the way to join his renegade army. In the end, Brown's plan goes horribly wrong and the first man killed in his raid is a free black man. Brown is put to death, but never backs down from his cause. I do love the style of this illustrator. This particular book he is the author and illustrator and I like it better than the ones that he collaborated with another author. John Brown is a very interesting figure in American History. Unfortunately, he was destined to serve as a martyr. He is often portrayed as a crazy man of violence. In truth, his crusade does dissolve into mayhem. Was this the only choice? Probably, considering the entire country eventually feel victim to a bloody Civil War in p I do love the style of this illustrator. This particular book he is the author and illustrator and I like it better than the ones that he collaborated with another author. John Brown is a very interesting figure in American History. Unfortunately, he was destined to serve as a martyr. He is often portrayed as a crazy man of violence. In truth, his crusade does dissolve into mayhem. Was this the only choice? Probably, considering the entire country eventually feel victim to a bloody Civil War in pursuit, of this crusade. I am fascinated by a figure that chose to fight another man's battle to the death. I had read this book over 3 years ago, but had forgotten that I had read it. I am so glad that I read it again as I learned (or relearned) many new things. Even though this is a children's book, it has a great message for adults to ponder. October 20, 2011: Because I had just read the book Fiery Trial: Abraham Lincoln and American Slavery this children's books caught my eye when I was at the library yesterday. I learned some new facts. I often learn many new things from books written for childre I had read this book over 3 years ago, but had forgotten that I had read it. I am so glad that I read it again as I learned (or relearned) many new things. Even though this is a children's book, it has a great message for adults to ponder. The classic historical figure brought to vivid life. This book was published on the 150th anniversary of the Harpers Ferry raid and includes some new research on this controversial man. Hendrix paints him as a common, ordinary man who had views and opinions which he could not ignore. In a tumultuous time period, John Brown was a man who stood up for what he believed in... and paid the ultimate price. Was he a saint or a madman? Maybe this book will help you and your middle-aged students decide. The graphics in this book add so much to the story that I really can't separate them. Great job! The words are powerful and helpful to help the hopeful history buff get a taste of some of the painful parts of America's history. This is not for the faint of heart and it is also not a morbid book by any means. It does try to relate with as much accuracy as a 9 to 12 year old can muster a true account of a very explosive event. The fonts also add poignancy to the tale. The illustrations in this book are a lot of fun, even though the subject is fairly heavy. I particularly liked the illuminated map of Kansas and Missouri. This picture book gives a pretty good overview of the "Bloody Kansas" incident, as well as the Harpers Ferry raid. The pictures and illustrated map give children a good understanding of the role that geography and the train lines played in the raid's failure. Interesting book -- John Brown is a complicated figure, and hard to explain in a way that makes sense for kids. But this book has a pretty good layout of his life, and the author's note adds a lot to the story, to the discussion about believing the right thing but maybe not having the right tactics, and about how his faith shaped his radicalism. I could see using this with say, fifth graders -- there's a lot here to talk about, and the illustrations are fantastic. John Hendrix is the illustrator of Nurse, Soldier, Spy and author/illustrator of Shooting at theStars, among others. He lives in St. Louis, Missouri.